The above table gives us a chance to compare the New Testament to other ancient books that today are considered trustworthy. We don’t have the originals of any of the six works listed here in the extreme left-hand column. But before they disappeared, the originals were copied. So historians look at the time gap between when the original was written (e.g. for Tacitus this was AD 100) and the earliest surviving copy (the oldest surviving copy of Tacitus was created in AD 1100), which is a gap of 1,000 years. 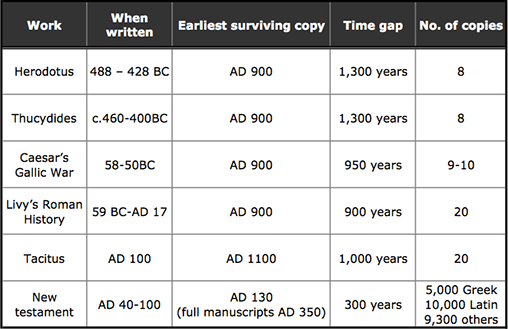 The shorter the time gap between the original document and the earliest surviving copy, the more sure we are that we’ve got an accurate copy of the original. As you can see, the New Testament does well by comparison. Its various books were written between AD 40 and AD 100. And there’s no dispute that the earliest bit we have of the New Testament is dated AD 130. This is a fragment of John’s Gospel, which is in the John Rylands Library in Manchester, England. We have large portions of the New Testament from about AD 200 and full manuscripts of the New Testament from AD 350. Looking at the extreme right-hand column, the greater the number of identical surviving copies we have, the more certain we can be that what we’ve got is an accurate copy of what was originally written. For the New Testament we have a total of 5,664 Greek manuscripts, and these were found in locations all over the ancient world. The similarity between them and 10,000 Latin manuscripts and a further 8,000 in Ethiopic, Slavic or Armenian, means we can reconstruct the text of the original New Testament from these copies. The result, according to scholars Norman Geisler and William Nix, is that ‘The New Testament, then, has not only survived in more manuscripts than any other book from antiquity, but it has survived in a purer form than any other great book’ (Norman L. Geisler and William E. Nix, A General Introduction to the Bible 1968; reprint [Moody Press, 1980], p. 367, cited by Strobel, The Case for Christ [Zondervan, 1998], p. 65). Summing up, Sir Frederic Kenyon, perhaps the world’s greatest expert of Greek papyrus and the former director of the British Museum, said: ‘In no other case is the interval of time between the composition of the book and the date of the earliest manuscripts so short as in that of the New Testament.’ He concluded: ‘The last foundation for any doubt that the scriptures have come down to us substantially as they were written has now been removed’ (The Bible and Archaeology [Harper, 1940], p. 288,cited by Strobel, The Case for Christ, p. 63).